Christmas-Kelly has agreed to terms with the Lynx on a contract, Kent Youngblood of the Star Tribune reports. The 29-year-old wing won a title with the Indiana Fever in 2012 and has started all 106 games she's been available for over the past four years. Over that span, she's averaged 11.0 points, 5.0 rebounds, 2.0 assists and 1.1 steals. The acquisition should help make up for loss of Lindsay Whalen, who retired after last season. It's possible Christmas-Kelley will end up a starter for Minnesota. Christmas-Kelly will miss the remainder of the 2018 campaign following knee surgery. She is expected to make a recovery in approximately six months. Christmas-Kelly started six of her seven appearances this season, averaging 9.3 points, 5.5 rebounds and 1.5 assists across 27.8 minutes. The surgery will be to address an osteochondral defect in her right knee. In Christmas-Kelly's stead, Glory Johnson and Kayla Thornton should see extra run. Christmas-Kelly tallied 15 points (2-4 FG, 0-1 3Pt, 11-14 FT), 10 rebounds and one assist during the Wings' 101-78 demolish over the Dream on Sunday. Christmas-Kelly could have reached double figures in scoring just from the free-throw line Sunday, as she drained a game-high 11-of-14 attempts while also adding 10 rebounds, good for her first double-double this season. In addition, the 29 year-old played the most minutes out of any Wings' player at just under 33 minutes. Christmas-Kelly mustered nine points (3-5 FG, 3-3 FT) and three rebounds during the Wings' 86-78 season opening loss to the Mercury. Christmas-Kelly started at small forward Friday and manged to shoot 60 percent from the floor while knocking down all three of her free-throw attempts. The 28-year-old is likely to continue to start at the forward position, bearing any major additions or improvements off the Wings' bench. Christmas-Kelly did not play during Sunday's 68-55 preseason win over Las Vegas. It's unknown why Christmas-Kelly didn't participate in Sunday's preseason contest, as it may have been just rest. The seven-year veteran averaged 10.4 points and 4.2 rebounds with the Wings in what was a fine 2017 campaign. Christmas-Kelley has opted to re-sign with the Wings. The seven-year veteran has hopped on board for what will be her fifth year with Dallas. She served as the team captain during the 2017 campaign and helped lead the team to a playoff berth by posting 10.4 points and 4.2 rebounds while starting every game. Christmas-Kelly was designated as a core player by Dallas. Christmas-Kelly helped lead the Wings to the playoffs last year, performing a key defensive role on the wing. The veteran forward put up 10.4 points, 4.2 rebounds, 2.2 assists, and 1.2 steals per game in 2017. By designating her as a core player, the Wings have secured exclusive negotiating rights with Christmas-Kelly. Christmas-Kelly contributed three points (0-2 FG, 3-4 FT), five rebounds, two assists, one steal and one block across 28 minutes during Sunday's 82-81 loss to the Liberty. Christmas-Kelly -- who averages 10.4 points, 4.2 rebounds, 2.2 assists and 1.2 steals per game -- has disappointed in the scoring department lately. Over the past two contests, she's combined for seven points on 1-of-7 shooting. She's rebounded well, however, posting a total of 14 boards over that stretch. Overall, 2017 was a typical regular-season campaign for the seventh-year forward, who's posted at least 10.4 points, 4.2 rebounds, 1.7 assists and 1.0 steal per game over the past three seasons. Christmas-Kelly accumulated 17 points (5-9 FG, 0-1 3Pt, 7-8 FT), five rebounds, one assist and one steal across 33 minutes during Sunday's 85-79 victory over the Sparks. Christmas-Kelly has now posted two consecutive nice outings after enduring a four-game cold streak where she totaled 20 points on 6-for-24 shooting. She's been far from consistent this season, though, so up-and-down stretches should be expected from her. Her 10.8 points, 4.1 rebounds, 2.2 assists and 1.2 steals per contest make her worthy of fantasy consideration, but she's always a candidate to throw up a dud. Overall, deploying her in DFS is high-risk/high-reward. Christmas-Kelly finished with 14 points (6-10 FG, 2-2 3Pt), five rebounds, four assists and one steal across 27 minutes during Friday's 93-80 victory over the Storm. After scoring a combined 20 points over the previous four games on 6-for-24 shooting, Christmas-Kelly bounced back Friday by dropping an efficient 14 points. She also chipped in a solid haul of supplementary statistics, helping boost her overall fantasy production. While she's not a premier option, Christmas-Kelly's 10.6 points, 4.0 rebounds, 2.2 assists and 1.2 steals across 29.4 minutes per game are worth consideration in DFS on many nights. Selected in the second round (23rd overall) by the Washington Mystics in the 2011 WNBA Draft on April 11, 2011. Waived by Washington on July 21, 2011. Signed as a free agent with the Tulsa Shock on July 22, 2011. Acquired by the Indiana Fever in exchange for Roneeka Hodges on July 2, 2012. Signed with the Tulsa Shock as a restricted free agent on February 5, 2015. Started and played in all 34 games…. Played in her fourth playoff game on 9/6… Averaged 10.4 points, 4.2 rebounds, and 29.7 minutes per game… Recorded a new career high in points with 27 on 5/30 against Indiana… Also registered a career high in field goals made with 10… Shot her 1500th WNBA career point against San Antonio on 5/25 along with teammate Skylar Diggins-Smith… Played her 200th career game on 5/30… Recorded her 5000th career minute on 7/30. Appeared in all 34 games for the Indiana Fever, starting three… Averaged 6.9 points per game and 3.6 rebounds per game in 21.6 minutes per game… Shot 34.3 percent from the field and 38.6 from the three… Starting in her first game of the season, Christmas scored a team high and season-high 18 points at Minnesota on June 22, tying a career-high in 3-pointers made with three… Also in Minnesota pulled down a season-high eight rebounds, tied her career-high in blocks with three and set a new career-high in steals with five… In her second start on June 25 in Tulsa, scored 17 points and a season-high 16 field goal attempts… Tied her season-high 18 points and grabbed a season-high nine rebounds in Atlanta on July 1… Ranked ninth in the WNBA in three point percentage with 38.6 percent. Appeared in all 34 games for the Indiana Fever, starting 28… Averaged career-highs with 8.6 points and 4.1 rebounds… Scored a career-high 21 points in an overtime loss in Connecticut on September 15… Ranked among the WNBA’s most improved scorers (+5.4 points per game) from 2012, scoring in double figures in seven straight games… Posted the first double-double of her career with 16 points and ten rebounds at Atlanta on June 25… In the playoffs, started all four playoff games… Led the team in points with 15.8 and assists with 2.5 per game… Had a playoff career-high of 16 points and grabbed nine rebounds in Chicago September 20… Finished with 15 points, six rebounds and four assists in a loss in Atlanta on September 2. Appeared in 16 games for the Indiana Fever… Averaged 2.9 points and 2.3 rebounds per game… Scored in double figures for the first time in a Fever jersey when she scored ten points and added a career-high seven rebounds, three steals and one blocked shot against Tulsa on September 23… In her first playoff appearance, Christmas played in three of the four WNBA Finals games, averaging 3.0 points and 2.7 rebounds… In Game 4 of the Finals against Minnesota on October 21, she finished with seven points, five rebounds and one blocked shot… Appeared in 14 games for the Tulsa Shock, starting six… Averaged 3.6 points, 1.9 rebounds and 11.5 minutes per game. 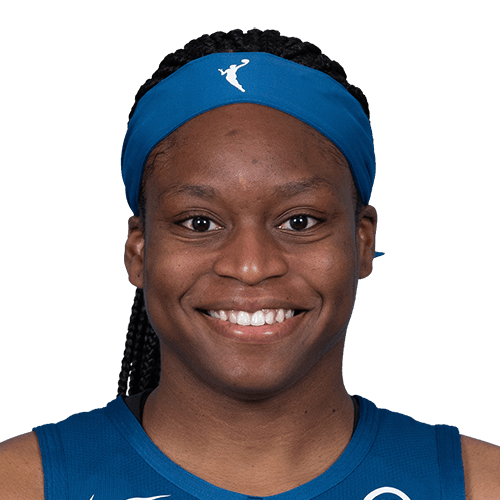 Appeared in 17 games for the Tulsa Shock… Averaged 9.9 minutes, 3.2 points and 1.2 rebounds a game… Had her best game with the Shock against the Phoenix Mercury on September 8, when she recorded 12 points and four rebounds… Appeared in 14 games for the Washington Mystics… Averaged 10.1 minutes, 3.4 points and 1.2 rebounds per game… Scored a season- high 13 points against Indiana on June 21. Became the 27th player in Duke history to score over 1,000 points in her career (1,052)… Averaged 4.7 rebounds per contest in her four years and tallied 204 steals and 160 assists… Helped Duke to back-to-back ACC regular season and tournament titles… Finished her career ranked 10th in school history in steals. 2010-11: Selected to the Philadelphia Regional All-Tournament Team and to the All-ACC Tournament First Team… Played in 36 games with 35 starts, averaging 9.5 points per game and pulling down 6.3 rebounds, 1.7 assists and 1.6 steals… Scored double-digits in 16 games including four games with 20 points or more… Scored a season-high 23 points in a 70-63 win over 10th-ranked DePaul in the NCAA Tournament regional semifinal, including hitting 7-of-16 in field goals and 9-of-14 free throws… Earned four double-doubles on the year… She went over 1,000 career points in the ACC Championship game against 19th-ranked North Carolina. 2009-10: As a junior, Christmas started 18-of-36 games, averaging 9.6 points, 5.3 rebounds, 1.5 assists and 2.2 steals with a field goal percentage of 43.1… Reached double-figures in 18 contests… Was a Memphis Regional All-Tournament Team honoree and selected to the All-ACC Tournament first team… Scored a career-high 25 points in a win over Maryland… Posted her second double-double of the season against Baylor in the NCAA Tournament with ten points and 12 rebounds… Started three straight games during the ACC Tournament, averaging 13.0 points, 3.7 rebounds and 3.3 steals… Grabbed a career-high 14 rebounds against Temple. 2008-09: As a sophomore, she earned a starting spot in two of the 33 contests and averaged 7.5 points, 4.2 rebounds, 1.0 assists and 1.4 steals… Shot 49.4 percent from the field, posting a season scoring high against Miami collecting 21 points, six steals, and hitting three three-pointers… She pulled down 13 rebounds versus Michigan State in the NCAA Tournament… She hit 17-of-37 from 3-point land for a 45.9 percentage, which ranked fifth all-time on Duke’s season charts. 2007-08: Coming off the bench in 30 games, Christmas averaged 4.1 points and 2.6 rebounds as a freshman… Reached double-figure scoring on two occasions against Penn State and N.C. Central, and pulled down a season-high seven boards against Virginia Tech… Shot 52.1 percent of her field goals. in the triple jump… Lettered in volleyball as a freshman and sophomore and was a member of the Superintendent’s Student Council.